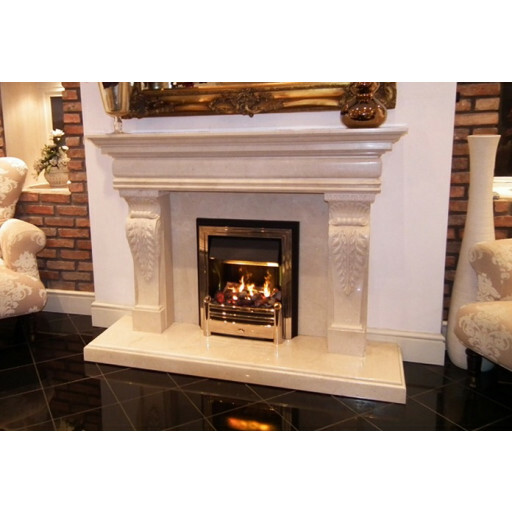 People who want to put a marble fireplace in their home should look no further than the Bellageo Sofital Natural Creme Marble Fireplace. The Bellageo Sofital Marble Fireplace’s elegantly sculpted pillars complement any tastefully designed study or living space. Similarly, the Sofital's creme-coloured marble stone is neutral, which means that it will work well with any type of decorative theme or paint colour present in your home. More specifically, the crème-coloured marble matches lighter paint hues, but will also stand out if your walls are painted brown, dark blue, or black. The Bellageo Sofital Marble's hearth is a rectangular-shaped slab of smooth stone marble that measures in at 1680 millimetres long. The Bellageo's firebox, on the other hand, is made from a range of flame-retardant metals, but it is the chrome-coloured finish on the firebox's interior that provides a nice visual contrast to the colour of the stone fireplace. Another interesting aesthetic element found on the Bellageo Sofital Marble Fireplace is that the fireplace's header has several different cuts in the marble, giving the face of this exquisite structure several artful layers that are sure to delight any guest who has the privilege of sitting in front of this one-of-a-kind fireplace. Had this fitted with a slate chamber and a sunvision gas stove and it looks beautiful in our living room. Wow what beautiful detail on this fireplace. It makes a statement in my room and looks so classy. Im over the moon with it. It looks fabulous in our living room. We loved the hand carving on this fireplace as you don't really see fireplaces with such skill and time taken to make. I thought if I'm going to do it I might as well do it properly. I spent more than I had budgeted for but the sales lady offered me the interest free " BUY NOW PAY LATER " deal the fireplace warehouse offer so I could have a full 12 months to save up to pay my fireplace off at no extra cost but have the goods fitted now. What an amazing deal. Every little helps.